James McCabe joined Triumph in August 2016 from Steel Partners Holdings where he last served as Senior Vice President and CFO, President, Shared Services, and SVP and CFO of its affiliates Handy & Harman and Steel Excel. 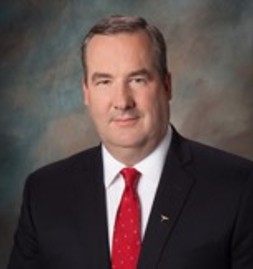 Prior to joining Steel Partners Holdings, McCabe served as Vice President, Finance and Treasurer of American Water’s Northeast Region, and President and CFO of Teleflex Aerospace, which served the global aviation industry. McCabe received a Bachelor of Science degree in business and economics from Lehigh University. He has previously qualified as a certified public accountant and Six Sigma Green Belt, and served as a member of the Board of Governors and the Civil Aviation Council Executive Committee for the Aerospace Industries Association.